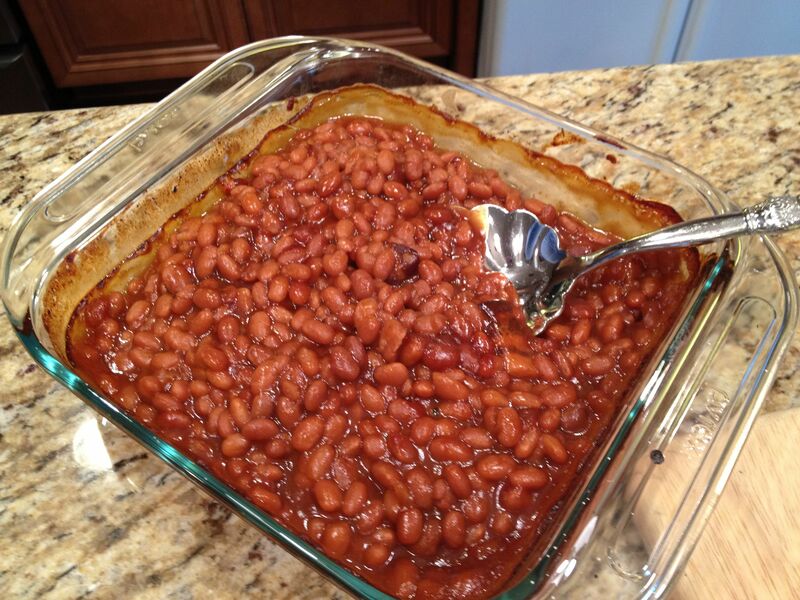 One of my husband’s favorite meals is a plate loaded with my sweet cornbread and these scrumptious baked beans. He can practically down the entire thing himself, and be perfectly happy. Now, as for myself and my other 3 boys, we need a little something more. So, I’ll usually throw on some grilled flank steak and a nice fruit salad to round it out. Cut 8 slices of the bacon into 2 inch pieces. In a large cast iron skillet, over medium low heat, fry the bacon just until fat is rendered, but not turning brown. Do not crisp the bacon, as we will need it to do that in the oven. Remove the bacon onto a paper towel to drain. Reserve a coating of the fat in the skillet to brown the onion. Add onion and cook over medium heat, until tender. Stir in the 3 cans of baked beans and warm through. In a small bowl, mix the barbecue sauce, brown sugar, vinegar and mustard. Add this mixture to the skillet, and bring to a simmer. Bake for 2 hours, until the beans are cooked and soft, the bacon is brown and crispy, and there is no soupiness to the dish.